Let’s admit it, during the winter season, though incredibly cold at times, every city acquires a special, almost magic allure. With the advent of Christmas, Milan enriches its yet wide offer with Christmas markets set in the most characteristic venues of the city and with fun, temporary ice-skating spots designed to amaze both Milanese and tourists. I guess everyone, at least once in his life, has wished to spend a movie-like afternoon skating on the shade of skyscrapers and majestic Christmas trees at the famous Rockefeller Centre in New York… Good news for you! There’s no need to go that far, as Milan from the first days in December until mid-January boasts a great variety of skating venues in the city’s most vibrant areas and suitable for both experts and amateurs. Take a look at our selection and… let’s take a glide! Great green hubs, small lakes, historic villas and museums are just some of the offers the Indro Montanelli Gardens can boast. 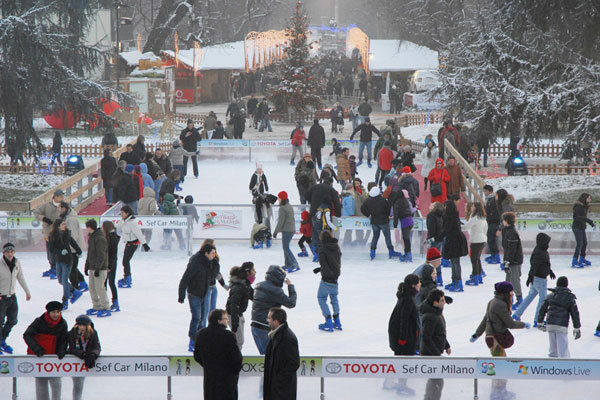 Set just a short distance from the Duomo, this majestic park on 1 December renews a peerless Christmas tradition with two covered ice rinks in the city where kids and adults can practice their best ice-skating moves and choreographies or just have fun in the heart of the city. Those keen on shopping for Christmas gifts, food and small objects won’t be deceived by the stands and small shops set inside the Village, located all around the rink. Feeling the festive vibes have never been easier thanks to the 3D Cinema in the gardens screening the best of Christmas-themed movies for a sweet revival experience. Ticket price 8 € (adults), 6 € (for children under 10). Open daily 10am-9pm. On 24 and 31 December 10am-6pm; on 25 December 3pm-7pm. For those in search of an interesting venue to spend a fun weekend whether with their family or with their beloved ones or friends, the research might be over! 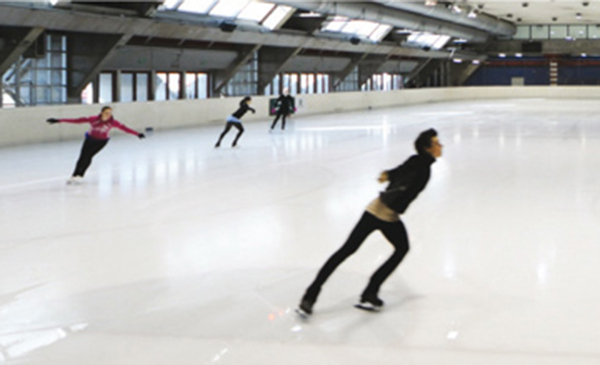 The well-known Forum in Assago, set just a little apart from the city centre has a lot to offer, boasting an impressive rink where its guests can both enjoy free skating and taking lessons for beginner or upper-intermediate skaters from experienced trainers. A morning, afternoon or evening on ice is an appealing choice, but a night on the ice skates is an exclusive offer not everyone can feature. Indeed, at Mediolanum Forum guests can have fun until late at night, for a long-lasting sliding experience and, on Saturdays, dance on ice on the notes of their favourite music. Ticket price 8 €, free access for kids under 3. The price for classes for children from 4 to 10 years costs 5 €. The ice-skating area at the forum is open Friday 9.30pm-1.30am; Saturday 3.30pm-6.30pm and Sunday 10am-12pm. Whoever said activities on ice are just about ice-skating might be wrong as the great rinks in the renowned Gae Aulenti Square reveal. Set in the heart of Milan’s futuristic district Porta Nuova, this temporary setting features the widest ice-skating rink located in the heart of the city dedicated to free skating, where visitors of all ages can enjoy lessons carried out by the resident official teacher Vitaly Ivaschinka, member of Milano Rossoblu Hockey. 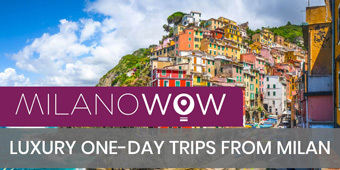 Enjoy a cheerful atmosphere born from a meld of traditional Christmas sports and an innovative location offering any facility its guests might need, from cafeterias to bookshops, from restaurants to exclusive boutiques. Open from 15 November 2018 to February 2019 Mon-Sun 10am-12am; Sat 10am-1am. In winter 2017 a large ice skating rink was inaugurated at the Bagni Misteriosi swimming pool. For the joy of youngsters and adults, this characteristic rink has been reconfirmed also for Christmas 2018. It is called Patinoire and it is a great location for families, with a small ice-skating rink good for kids. 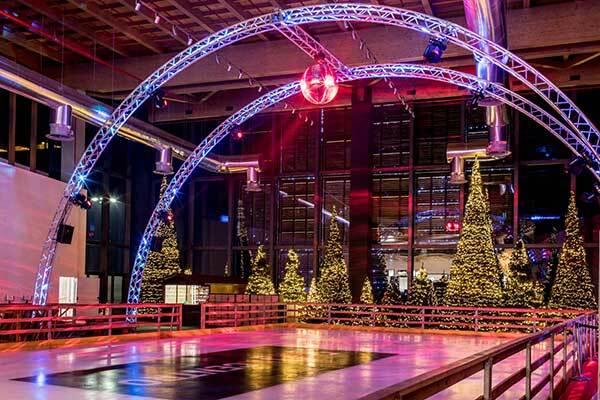 The festive atmosphere, as well as entertainment, are guaranteed by music and live performances daily enlivening the rink. 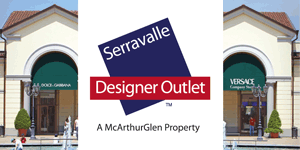 Open from 2 December to 27 January. From 2 to 24 December and from 7 to 27 January open Mon-Fri 4.30pm-7.30pm (closed on Tuesday), Sat and Sun 10.30am-7.30pm. From 25 December to 6 January open daily (Tuesday excluded) 10.30am-7.30pm. Not only shopping at Il Centro, but entertainment as well. Located in the heart of the shopping centre, the ‘Il Centro on Ice’ ice-skating rink is open to guests all ages for all the festive period, offering different entertainment options for the whole family. The youngest guests approaching the world of ice-skating for the first time can take advantage of penguin or bear-shaped tutors to start gliding in full safety; access to the rink includes the rent of gloves and skates. Access ticket: 5 euro. Open from 24 November to 3 February 2019. Open daily 11am-1pm and 2pm-9pm. On festive days open 10am-9pm. 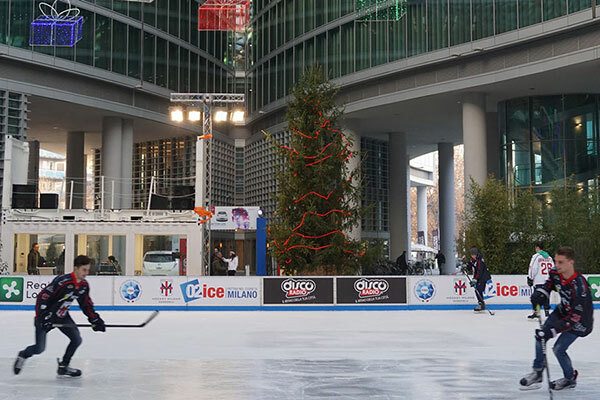 Winter 2016 has marked the opening of a brand-new, spectacular ice-skating rink located underneath Palazzo Lombardia. Nestled within the regional administration palace, this covered new destination for ice lovers offers ice skates for rent and features countless sport possibilities, from free-style gliding to skating lessons, enhanced by special hockey and acrobatic ice-skating live performances held by professionals and champions of the sector. Ticket price with ice skates rent 7 euros per hour. 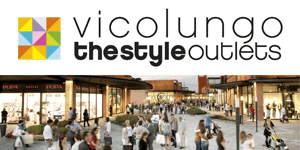 Open from 12 December 2018 to 3 February 2019. 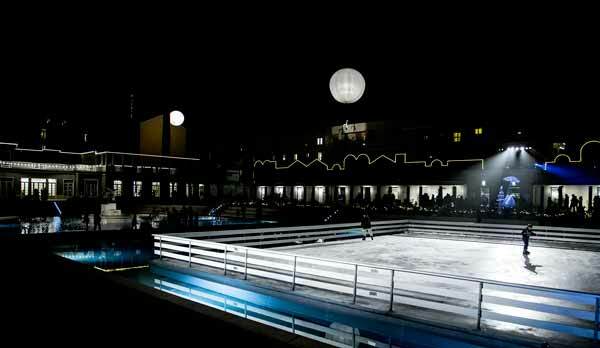 A small yet enchanting ice skating rink can be found in Largo Beltrami, near the beating heart of the city. Here both expert skaters ad beginners can glide with a wonderful panorama, with the Sforza Castle on the background. The rink is open from 1 December until 31 January 2018 10am-12am. On festive days open 10am-2pm. 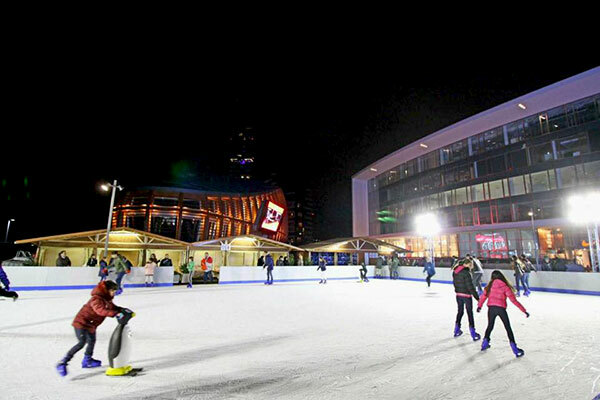 For the first time, a small yet thrilling ice-skating rink has been located underneath the futuristic towers of CityLife, in one of the squares of the CityLife Shopping District. Thanks to the strategic position, guests can conjure shopping, dining and entertainment all-in-one. 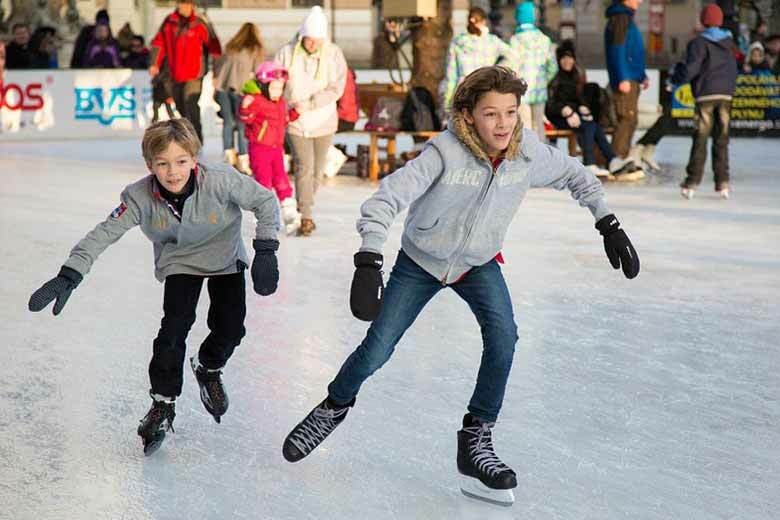 The rink is open from 6 December to 28 February 2019.